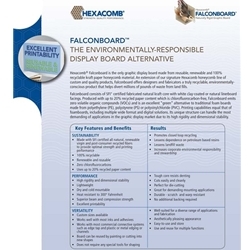 FALCONBOARD® foamboard is a high-quality, lightweight, rigid and recyclable graphic display material suitable for a broad range of uses in the visual merchandising market. Ideal for displays, signs, digital imaging, exhibits, POP, screen printing, vinyl graphics and kiosks. It withstands its stability and rigidity under representative indoor humidity and temperature fluctuations. It is printable on both sides and can be direct-printed, upholstered, laminated, veneered, pressed with decorative foils or painted. Falcon Board can also be miter cut, folded or curved.